Whisk wheat flour, sugar, baking soda and salt in bowl until blended and set aside. In a separate bowl, whisk together buttermilk with eggs. Using a wooden spoon, stir wet ingredients into dry ingredients until just combined. Add melted butter, then blueberries, and stir gently. Heat a non-stick griddle or pan over medium heat. Let a few drops of cold water fall on the surface. If bounces, sputters or instantly evaporates, your pan is ready. Pour 1/4 cup of the batter onto the skillet. Cook for 2 minutes, or until bubbles that appear on the surface are beginning to break and bottom is golden. Turn pancakes over, cook 1 minute or until lightly golden. 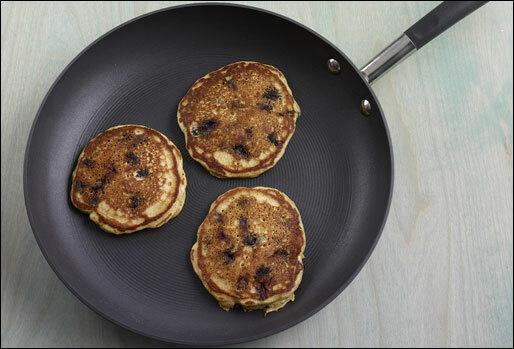 Place pancakes on heatproof platter and keep warm in a 200 degree preheated oven. 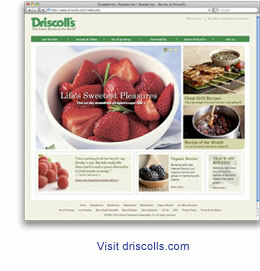 A berry delicious pancake recipe courtesy of Driscoll's Berries. 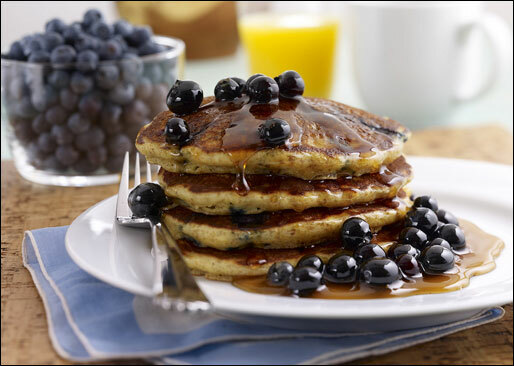 Picture perfect, healthier than usual pancakes. Recipe number 2972. Submitted 1/7/2011.